On 20 November, I was invited to present in an Indigenous Human Rights course for first year students in Applied Indigenous and Ethnic studies at Northern Arizona University, Flagstaff. The students’ response to my discussion of Native American imagery in Germany, as well as the Nazis’ utilization of these images for ideology-driven propaganda, helped me further to put some of my experiences on this lecture and research tour into perspective. In a sense, this posts continues some ideas from the previous one on American Exceptionalism. Some students wondered in how far German hobbyists were aware that their activities, their expressions of affinity for Native cultures, actually helped perpetuate stereotypes. I must say I was surprised about the question because my presentation had emphasized the complexity of German perceptions of Native America, rather than simply proclaiming that Germans did not tell the ‘true story’ of Native American cultures. My work is less concerned with whether or not representation is stereotypical but how images are used for identity formation and “othering.” Yet, the many lectures in diverse settings (conferences, classrooms, general public) on this tour, as well as my observations during the ASA convention in early November, gave me better insight into the – often very different – perspectives of Native, Euro-American, and European students on Native America. This point was brought home during a hike in the shadow of the San Francisco Peaks near Flagstaff. talking about working conditions and classroom experience, two colleagues from the Applied Indigenous studies program pointed out to me that many non-Native students grow up in social “bubbles” – their social environment as well as their school education shield them from the often brutal social realities many Native students face, both in urban and reservation settings. They rarely meet Native children or see their living conditions, and history and social studies education tends to avoid addressing the “dark” side of American history and race relations so they tend noit to learn about these issues in school. While it is true that there are Native professors and famous writers and artists, many Native children still grow up in poverty, experience alcohol and drug abuse in their communities, are asked by their non-Native fellow students whether they grew up in a tipi once they enter the university, or have to explain why so many Native people do not feel ‘honored’ by the Washington Redskins. Non-Native American students do not learn much about the Native perspective on frontier history before college and, if they don’t grow up near a reservation, it is unlikely that they are confronted with social realities and hardships of contemporary Native America. College instructors (and Native students) thus often have to explain the basics and deconstruct stereotypes that have prevailed in American perceptions of Native America for centuries. Conversations like these helped me get a better perspective on the issue: I have known about these stereotypes since childhood, have seen them deconstructed since I went to school in Germany, and have studied their effects in college. Yet, as a German observer of (Native) American culture, I am still an outsider looking in: I sometimes experience these stereotypes in my German classrooms and my research, but I don’t have to fight a constant uphill battle confronting them on my way to school or in my neighborhood. I don’t face discrimination on the job market, nor am I getting racially profiled by law enforcement because of them. In addition, as a European scholar, I know about these problems because I am interested in studying them and because European traditions in high school and college education tend to discuss these problematic social and ethnic issues of American culture and society. Many American students, however, grow up in these comfortable and protected bubbles (mostly by no fault of their own) that rarely force them to confront social problems and critically analyze the complex social realities of their own country. And here, we are back to James Loewen’s critical assessment of Social Studies and American history courses at high school level. Not only does the overt patriotism in many textbooks paint American history as a rose-colored (better: red, white, and blue) sequence of success stories, it seems that the era of political correctness contributed to the situation by avoiding problematic issues altogether (such as massacres in the 19th century, or ongoing poverty on the reservations today), focusing instead on positively portrayed examples of racial harmony. To give you one example: An editor for my book project Fellow Tribesmen asked me to contextualize my reference to J.F. Cooper’s Leatherstocking Tales in my manuscript more detail. I wondered if this wasn’t a waste of ink, since we could assume that the Last of the Mohicans was common knowledge? My editor replied that these novels are no longer taught in many schools because of their stereotypical depiction of Native people. I’m still perplexed about this decision – for once, these novels comprise classic American literature that set the stage for an entire, genuinely American genre. Why not teach them and put them in perspective? To keep talking about race relations, wouldn’t this be a perfect opportunity to teach the role and effect of stereotyping and othering, even at high school level? Wouldn’t it be great to show how Euro-Americans learned to differentiate Native peoples into ‘noble’ and ‘brutal savages’ in the early 19th century, and how these depictions led to notions of Manifest Destiny? Couldn’t these examples serve as springboards to discuss othering and cultural stereotypes in contemporary American society, and wouldn’t they help explain current social problems? I have often wondered about angry outbursts from Native colleagues and students regarding this situation, or about surprised student’s reactions that many Europeans know about frontier history, Indian removal policy, assimilation pressure, and cultural appropriation, that many Europeans root for the ‘Indians,’ instead for the cowboys, in Western movies. Given the perpetuating realities of these separate bubbles of poverty, social struggle, and ignorance, I have developed a better understanding in the last few weeks why many Native students and faculty appear so frustrated with the situation and why they perceive it as a never-ending, exhausting uphill battle. This is a major realization I take home from this trip. I recently returned from the American Indian Workshop, the annual meeting of scholars in Native American studies in Europe, bringing together scholars from literary and cultural studies, cultural anthropology, and history. 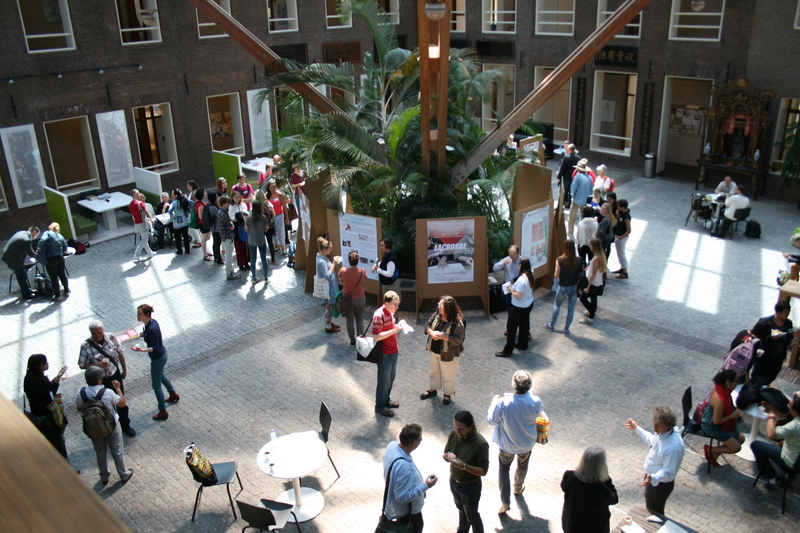 This year’s meeting, the 35th, was held in Leiden, the Netherlands on 21-25 May. Only belatedly (embarrassing for a historian) I connected the dots when a university dignitary said during the opening “Welcome to Leiden, where it all began”: the Pilgrims spent a few years in exile in Leiden before making their trip on the Mayflower and eventually establishing Plymouth colony (apparently because they felt that their children were becoming “too Dutch”). The local museum dedicated to the Pilgrims was closed both times I went to see it – maybe I should have memorized the opening hours the first time I stood at closed doors. More lucky colleagues told me a lot about the small but very intriguing collection of furniture, clothing, and books. Back to Leiden and the AIW (I might come back to discuss my impressions of the old town in a later post) – I was curious about a new feature on the conference program. The organizers had set up a poster session in which MA-level students, but also a Dutch company and, if I’m not mistaken, NGOs presented their work. This piqued my interest because, as of now, I had heard about and seen poster sessions only in the natural sciences and social sciences, but not in the humanities. In the conferences I co-organized, we discussed the format as a way to accommodate an extraordinary number of presentation proposals but eventually decided against it. We were concerned that, particularly in literary and cultural studies, it would be impossible to express complex ideas with eye-catching visuals and that, eventually, posters would become what the German language calls a “Bleiwüste” (text-heavy; literally, a “desert of hot type”). The posters I saw at the AIW, however, were nothing of the sort. Many presenters neatly structured their posters into research questions, short notes on methodology, data collection, and conclusions. Some included photographs from field work or from their cooperation with local Native American scholars and communities. without having to fear that going deep at this point will dominate the floor and discourage other comments. I enjoyed this format very much and had the impression that the presenters were glad about the opportunity for such detailed feedback. It might also have helped that the session room also hosted the birthday cake – keynote speaker Henrietta Mann turned 80 that day and was presented with a song by all participants (sung in their respective languages), and with this wonderful Dutch cake. This is how I like academia: merrily munching and chatting away! Berghahn Books has recently begun its promotion for my forthcoming monograph Fellow Tribesmen which analyzes how the German enthusiasm for Native Americans interrelated with German national identity formation throughout the 19th century and, eventually, was appropriated for Nazi propaganda. The book will be out in July 2015. I’ll post updates on the production and advertizing process as they come in. I went to Tübingen on 6-7 May to hold a guest lecture on Wild West shows in Europe. Tübingen, a small town near Stuttgart in the region of Swabia in Southwest Germany, is one of the reputable traditional university towns. As Leipzig is proud of Goethe’s time as a student at its university (most of which he apparently spent partying), Tübingen is proud to have many German Romanticists, such as Hölderlin and Hauff, as well es the philosopher Hegel, among its former faculty, students, and residents. The lecture on Wild West Shows addressed several aspects of German perceptions of Native Americans (and vice versa) that I explored in my dissertation, such as German impresarios’, newspaper reporters’, and the audiences’ expectations and reception of Native American show performers, but also a perspective on the Native experience and motivation to join these shows. My presentation was integrated in Prof. Astrid Franke’s lecture on “Issues in American Literary and Cultural History from the Civil War to the First World War” and was videotaped. I will post a link to the video as soon as it is published. It was a great opportunity to return to my general research interest in German/European representations of Native America. I will probably post more entries in the future to discuss anecdotes and examples of Indian imagery popping up in German history and current everyday life. Whenever I come to a new town, I like to walk around to get a feeling how it is laid out: what are the distances and major landmarks, how do these landmarks look from different perspectives and how does the structure of the town relate to them (e.g. in the line of view). It is always exciting to see the “underside” and subcultural aspects of a place as well, so I look for graffiti, stickers on lamp posts, and posters, no matter if they advertise festivals, political events, or garage sales. I will take some time in future entries to post pictures of signs from different places I came across and found remarkable. “Walking the map” of Tübingen, I happened upon a little bridge, called the “Indianersteg” (Indian’s Footbridge). 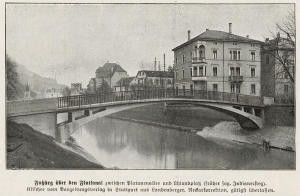 It’s simply a small pedestrian bridge connecting the southern part of town with an oblong island that parts the Neckar river across from the old town and is laid out as a park. Tübingen’s official wiki states that the name comes from children playing Indians at this bridge. The title’s first occurrence in official records is from a 1871 report on an accident. This fits nicely into my presentation topic: Discussing ethnographic exhibitions (Völkerschauen) and Wild West shows, I explained that, although “Indianthusiasm” as a phenomenon developed since c. 1800, these shows helped turn it into a feature of popular mass culture during the 1870s and 1880s. The fact that children met at this bridge to play Indians in the 1860s and early 1870s tells us that this cultural practice was already widespread at a time when the popularity and high frequency of these shows as just starting, several years before Buffalo Bill first toured Germany (1890) and Karl May published his first Winnetou novel (1893).